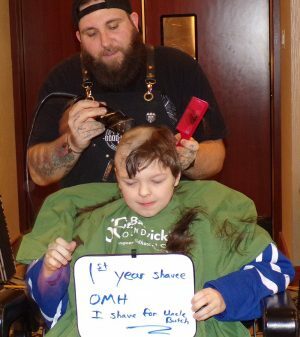 OSWEGO, NY – Even before a single lock of hair was shorn this year, the Oswego St. Baldrick’s group was proclaimed “amazing” by the national St. Baldrick’s Foundation. “We tip our hats to you and your achievement of having raised $710,269.44 to date for childhood cancer research,” Kathleen Ruddy, chief executive officer of the national foundation, wrote to Oswego’s volunteer coordinator Dan Witmer. “It’s nice to get recognition like this. But we’re doing it for the kids. That’s what we’re all about,” he told Oswego County Today. 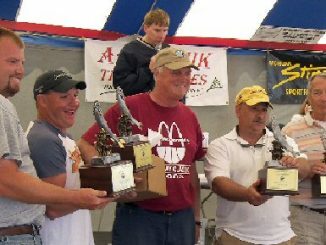 Shortly after 1 p.m. the total for this year had surpassed $68,000 – with more cash and on-line donations to be counted. Last year’s total was more than $83,000. Organizers hope to beat that when this year’s final tally is announced. 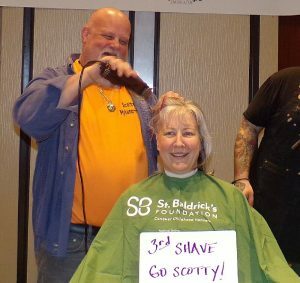 Several dozen volunteers put on the 13th annual St. Baldrick’s Foundation fundraiser Sunday at the Lake Ontario Event and Conference Center. All afternoon around 120 shavees paraded to barber chairs and had their hair shaved by volunteer barbers. From elementary school students to senior citizens, they were all there on a mission – to help end childhood cancer. Members of the Fulton Police Department and Oswego County Sheriff’s Department squared off in a friendly competition to raise thousands of dollars for the cause as well. Various other sponsors supported other teams. Some shavees went out and raised funds on their own. Many shavees were taking part in memory of a loved one. “Oh my gosh, the last time I saw you with no hair you were just a little baby,” exclaimed one of his supporters. The youngster said he had his head shaved in memory of family members who passed away from cancer. 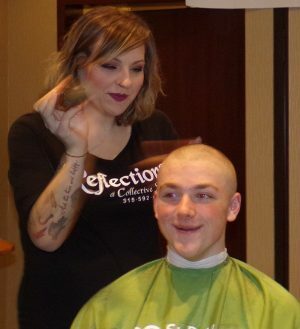 Carson Colucci, is a St. Baldrick’s veteran. He has earned the nickname Mr. St. Baldrick’s having taken part for the last 11 years. And, he hasn’t even graduated high school yet. “I started out because I wanted to help raise money for kids that had the misfortune of getting cancer. I don’t remember how much I raised back then. My second year was around like $2,200,” he said. This year, he raised around $1,700. That brought his overall total to more than $14,000. The number of children each year who are diagnosed with some form of cancer is 175,000.